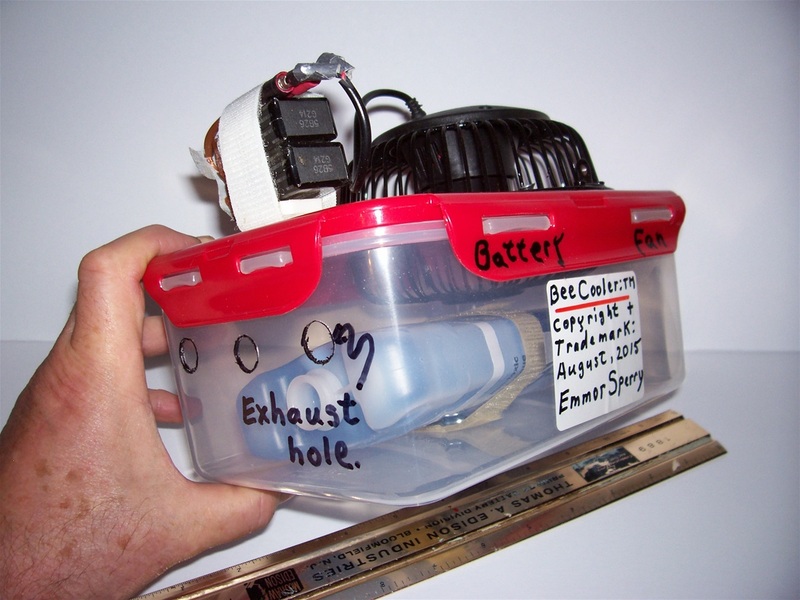 "BeE Cooler:TM" is a Toy air-conditioner that really works! “BeE Cooler:tm” is a new portable and personal air-conditioning apparatuses. “Bee Cooler:tm” is a trademark design for a new and Portable type of air-conditioner. BeE Cooler: tm is comprised of one 4 inch diameter fan, that is operated by a 9 volt, .5 watts direct current fan motor. 1 or 2- 9 volt batteries. One frozen 11.5in. by 8.5in. by 2 inch Gel pack [Diethylene glycol]. One Plexiglas Acrylic or Poly[methylmethacrylate] box that is 14in. by 11in. by 3 inches and the box has a lid. Size of box and gel pack can very. paragraph [#1] and paragraph [#2 to #7]. in-taking warm air and exhausting cooler air. [#3]An air-conditioner as set forth in paragraphs[#1 & #2] wherein the air-conditioner is designed so that the in-take air is supplied from a fan that is mounted in a hole [4 inch hole] cut into the Plexiglas Acrylic box. An air-conditioner as set forth in paragraphs[#1 &2 &3] wherein the air-conditioner has a frozen gel pack placed in the Plexiglas acrylic box. An air-conditioner as set forth in paragraphs[#1 &2&3&4] wherein three ½ inch diameter holes are drilled in the end of the box. The end of the box that is farthest from the in-take fan hole. An air-conditioner as set forth in paragraphs[#1&2&3&4&5] wherein the in-take air flows around a frozen gel pack and then the air is exhausted out of the 3 exit holes of the box. An air-conditioner as set forth in paragraphs[#1&2&3&4&5&6] wherein there is a belt or rubber or other type of fastening support for the frozen gel pack to the box, within the box. This trademark design relates generally to a “heat exchanger air conditioner”, and particularly to a portable light weight and inexpensive to manufacture and to operate air conditioner. BeE Cooler:tm is designed to relieve the pain of an over hot environment. It has been over 100 years since air-conditioner was invented, and people have increased the use of air-conditioning every year since. With the improvement of living quality, air-conditioner has been widely used in people's life but at the same time, is a pollutant. Air-conditioning can be a waste of energy, can damage ozone layer, etc. A traditional air-conditioner consists of: Energy in put, ether AC or DC electrical power, an Evaporator, a Compressor, a Condenser and Meatal housing. A traditional air-conditioner, is at times, expensive to manufacture, expensive to operate and inconvenient to use or not available at all in a lot of situations where over heating of people or other animals is present. People have been paying more attention to sustainable development. Bee Cooler:tm has convenience and utilization, It has quality and comfort level improvement indoors and out doors, It has green standards and is environmentally friendly, and cost and function of Bee Cooler:tm is within an acceptable level. The frozen Gel Pack has to be replaced every hour to hour and 15 minutes. Solution---Carry 2 or 3 frozen Gel Packs in an insulated [Thermos type] bag. The batteries have to be replaced or recharged every couple of hours. Solution---Carry a couple of extra batteries. Applications and use of Bee Cooler:tm. For people at sporting events. Any place where people or animals would like a little relief from the hot weather. There has thus been outlined, the more important features of Bee Cooler:tm in order that the detailed description thereof may be better understood, and in order that the present contribution to the art may be better appreciated. There are, of course, additional features of Bee Cooler:tm that will form the subject matter of the claim appended hereto. Those skilled in the art will appreciate that the conception, upon which this disclosure is based, may readily be utilized as a basis for the designing of other structures, methods and systems for carrying out the several purposes of the present trademark design. It is important, therefore, that the claim be regarded as including such equivalent constructions insofar as they do not depart from the spirit and scope of the present trademark design, titled “Bee Cooler:tm” . The purpose of the foregoing, is to enable the public, and practitioners in the art who are not familiar with new trademark designs, to determine quickly from a cursory inspection the nature and essence of the technical disclosure of the apparatus . The foregoing is intended to define the trademark design of the Bee Cooler:tm, which is measured by the claims, it is not intended to be limiting as to the scope of the trademark design in any way. It is therefore an object of Bee Cooler:tm to provide a new air-conditioner design which has new and improved advantages. It is another object of Bee Cooler:tm to provide a new air-conditioner design which may be easily and efficiently manufactured and marketed. It is a further object of Bee Cooler:tm to provide a new air-conditioner design which is of a durable and reliable construction. An even further object of Bee Cooler:tm is to provide a new air-conditioner design which is susceptible of a low cost of manufacture with regard to both materials and labor, and which accordingly is then susceptible of low prices of sale to the consuming public, thereby making such air-conditioners economically available to the buying public. Another object of Bee Cooler:tm is to provide a new air-conditioner wherein the same is formed as a heat exchanger that increases the effective manner of relieved from over heated situations. Fig: 1 is a top view with fan and battery. Fig: 3 is the end view with the exhaust holes. Fig: 4 is a bottom view with Gel pack in place. With reference now to the picture/drawings, and in particular to FIGS. 1,2,3 & 4 thereof, a new air-conditioner design, titled “Bee Cooler:tm” embodying the principles and concepts of the present trademark design are. Bee Cooler:tm is for effecting an increased ease of cooling application. As to the manner of usage and operation of the trademark design, the same should be apparent from the above disclosure and accordingly no further discussion relative to the manner of usage and operation of Bee Cooler:tm shall be provided. The foregoing is considered as illustrative only of the principles of BeE Cooler:tm. Since numerous modifications and changes will readily occur to those skilled in the art, it is not desired to limit the trade mark design to the exact construction and operation shown and described, and accordingly, all suitable modifications and equivalents may be resorted to, falling within the scope of the trade mark design. Enclosed within and as part of this document is a picture of a working prototype of the trade mark design titled “BeE Cooler:tm”. copyright number [ TXu 1-976-210 ]. American, Canadian and foreign patents are under acute consideration. Carpenter One: TM is a trade mark design for a new and improved type of Carpenters hammer. 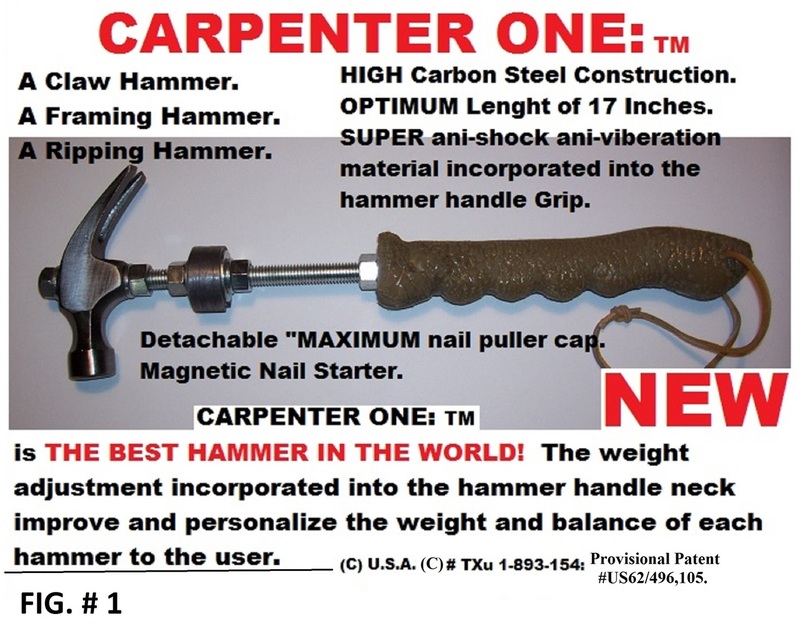 [#1] A “Carpenter One:TM” hammer is a traditional Carpenters Hammer wherein the carpenters hammer is from 14 to 18 inches in length and 12 to 22 ounces in weight. [#2] A Carpenter One: TM hammer as set forth in paragraphs # 1 wherein there is a 1 to 6 once weight adjacent to the head of the hammer and is incorporated into the hammer handle. [#3] A Carpenter One: TM hammer as set forth in paragraphs # 1 and #2 wherein the 1 to 6 once weight can slide from the neck of the hammer head to a position 6 inches down the hammer handle. [#4] A Carpenter One:TM hammer as set forth in paragraphs # 1 and #2 and #3 wherein the one to six once weight can be adjusted and locked securely in the desired position on the hammer handle. [#5] A Carpenter One:TM hammer as set forth in paragraphs # 1 and #2 and #3 and #4 wherein the head of the hammer can be unattached and replaced with a different head. Do to the fact that the hammer shaft is threaded [Male Thread] and the hammer head is threaded [Female Thread]; one head can be screwed off and another hammer head can be screwed on. An example would be a claw head replaced with a framing head or ripping hammer head. of an inch by 3/4 of an inch, can be screwed on to the top of the hammer head and assist in pulling out nails via the extra fulcrum leverage it supplies to the hammer head. This cap is titled: "Maximum nail puller cap." [#7] A Carpenter One:TM hammer as set forth in paragraphs # 1 and #2 and #3 and #4 and #5 and #6 Wherein regard to magnetic nail starters as an incorporated part of a lot of framing hammer heads; most people are right handed, with this in mind ,it would be faster and easier to place the nail in the hammer head by the user,if the magnetic nail starter was incorporated into the hammer head on the left side of the hammer. This trade mark design relates generally to Carpenters hammers and particularly to a Carpenters Framing Hammer with one new improvement used to adjust and personalize the balance of the hammer. Do to the design of a traditional carpenters hammer a person/carpenter has to accept the balance, length and weight of the hammer that he buys. All people very in their arm strength and arm length and the length of time that they are using a hammer, so a standard hammer may not always be the best balance or weight for a particular job at a particular time. This can result in mussel tiredness and mussel strain in the arm and back. ADVANTAGES OF “CARPENTER ONE:TM” OVER TRADITIONAL CARPENTERS HAMMER. In view of the foregoing disadvantages inherent in the known types of Carpenters hammers now present in prior art, the present trade mark design provides a apparatus wherein the same may be improved to effectively increase the personal balance of a carpenters hammer. This enables a carpenter to do more hammering carpentry work in a defined period of time with less strain on his muscles . There has thus been outlined, the more important features of Carpenter one:tm hammer in order that the detailed description thereof that follows may be better understood, and in order that the present contribution to the art may be better appreciated. There are, of course, features of Carpenter One:tm that will be described hereinafter and which will form the subject matter of the claims appended hereto. Those skilled in the art will appreciate that the conception, upon which this disclosure is based, may readily be utilized as a basis for the designing of other structures, methods and systems for carrying out the several purposes of the present trade mark design. It is important, therefore, that the claims be regarded as including such equivalent constructions insofar as they do not depart from the spirit and scope of the present trade mark design, titled “Carpenter One:TM” . The purpose of the foregoing, is to enable the public, and practitioners in the art who are not familiar with new trade mark designs, to determine quickly from a cursory inspection the nature and essence of the technical disclosure of the apparatus . The foregoing is intended to define the trade mark design of the Carpenter One: TM, which is measured by the claims, it is not intended to be limiting as to the scope of the trade mark design in any way. It is therefore an object of Carpenter One:TM to provide a new and improved Carpenters hammer apparatus which has all the advantages of the prior art and the new and improved advantage. It is another object of Carpenter One:tm to provide a new and improved Carpenters hammer apparatus which may be easily and efficiently manufactured and marketed. It is a further object of Carpenter One:tm to provide a new and improved Carpenters hammer apparatus which is of a durable and reliable construction. Manufactured from such materials as Titanium, steel, and Carbon fiber or wood or a combination of such materials. An even further object of Carpenter One:tm s is to provide a new and improved hammer apparatus which is susceptible of an acceptable cost of manufacture with regard to both materials and labor, and which accordingly is then susceptible of a acceptable prices of sale to the consuming pubic, thereby making such a hammer economically available to the buying public. Another object of Carpenter One:tm is to provide a new and improved hammer wherein the same is formed as a hammer that increases the effective use of a carpenters hammer. These together with the various features of novelty which characterize the trade mark design, are pointed out in claims that are forming a part of this document. For a better understanding of the trade mark design, reference should be made to the accompanying drawings/photographs and descriptive matter in which there is illustrated preferred embodiments of the design. FIG. 1 is a side view illustration/picture of the trade mark design. FIG.2 is a side view illustration/diagram of the trade mark design. With reference now to the picture/drawings, and in particular to FIGS. 1&,2 thereof, a new and improved carpenters hammer apparatus, titled “Carpenter One:TM” embodying the principles and concepts of the present trade mark design are enclosed. Carpenter One:tm is for effecting an increased ease of operation and increase Hammer balance to carpenters and people using carpenters hammers. As to the manner of usage and operation of the trade mark design, the same should be apparent from the above disclosure and accordingly no further discussion relative to the manner of usage and operation of Carpenter One:tm shall be provided. With respect to the above description then, it is to be realized that the optimum dimensional relationships for the parts of the trade mark design , to include variations in size, materials, shape, form, assembly and use, are deemed readily apparent and obvious to one skilled in the art, and all equivalent relationships to those illustrated in the drawings and described in the document are intended to be encompassed by the present trade mark design. The foregoing is considered as illustrative only of the principles of Carpenter One:TM. Since numerous modifications and changes will readily occur to those skilled in the art, it is not desired to limit the trade mark design to the exact construction and operation shown and described, and accordingly, all suitable modifications and equivalents may be resorted to, falling within the scope of the trade mark design. Enclosed within and as part of this document is a picture of a working prototype of the trade mark design titled “Carpenter One:TM”. Carpenter One:tm can be used as a claw hammer, a framing hammer and a ripping hammer.With a waffle or smooth face. Vytaflex 50,a urethane rubber material that is super ani-shock and ani-vibration is incorporated into the hammer handle grip to help reduce vibration of hammer, this in turn reduces muscle strain. Carpenter One: TM. Copyright-October 14, 2013: by [Emmor Ray Sperry,1150 Davis Street,Box 1043,Rossland British Columbia, Canada,V0G 1Y0]. The distinctive design of " Carpenter One:TM ", the words " Carpenter One:tm " are trademarks of Emmor Ray Sperry. 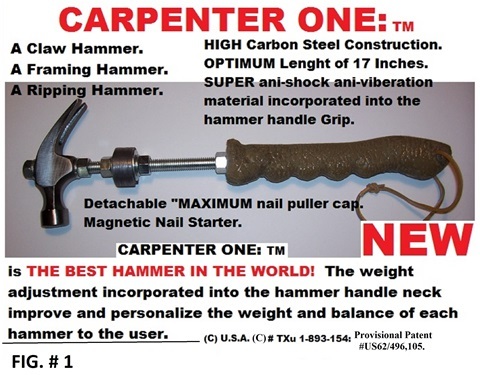 An excusive copyright is claimed on the entire text, all drawings and sketches of “Carpenter One:TM ” that exist and the Hammer apparatus, titled “Carpenter One:TM ”. Any infringement on this copyright or this trademark, in whole or in part, without permission in wrighting from Emmor Ray Sperry, is strictly prohibited. United States registered copyright number is "TXu 1-893-154". American, Canadian and foreign patents are under acute consideration. “Vertachair:tm” is a trade mark design for a new and improved type of sitting chair. assembled [ Puts togrther in minutes without glue ] by the consumer. [#1] Vertachair:tm is similar to a traditional dining room table chair [ both side chairs and arm chairs] that has a seat 16 to18 inch from the floor; a back that is about 35 to 45 inches high; 16 to 26 inches wide at the front and 13 to 23 inches wide at the back of the seat and a depth of 16 to 24 inches. This trade mark design applies to living room chairs, counter-height chairs, benches and any piece of furniture that is designed to sit on. The trade mark design of Vertachair:tm has one  new features added to a traditional chair to improve posture and particularly to help relieve the pain, of vertebra and mussel stress do to chronic back pain. 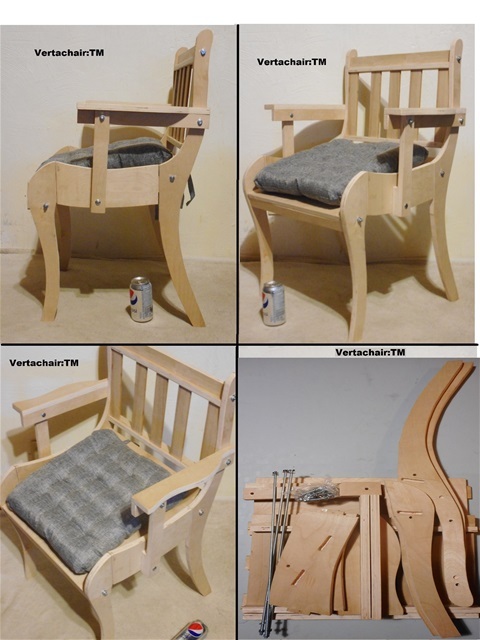 The new design in which an exclusive property or privilege is claimed from a traditional chair to the trade mark design, titled “Vertachair:tm” are defined, in this paragraph [#1] and paragraph [#2]. [#2] A traditional Dining room table chair as set forth in paragraphs[#1] wherein the seat of the chair has an incline slope of 10 to 20 degrees and 15 degrees is the optimum angle below the horizontal plain. [A] This trade mark design relates generally to sitting chairs and particularly to a chair with one new improvement used to improve posture and particularly to help relieve the pain, of vertebra and mussel stress do to chronic back pain. Also, the back of the Vertachair is always perpendicular to the floor. [B] It has long been known that chairs are use to sit on. That traditional chairs have a seat that is parallel with the floor and is horizontal. [C] Do to the design of a traditional chairs a person is sitting with all of his/her upper body weight on the base of the spine; this can cause pain and/or create pain in the persons back. [D] In view of the foregoing disadvantages inherent in the known types of chairs now present in prior art, the present trade mark design provides a trade mark design wherein the same may be improved to effectively decrease amount of pain from sitting in a traditional chair. Also with the Vertachair design a person is able to sand up easier from the sitting position. Vertachair improves a persons posture. When using Vertachair a portion of a persons upper body weight is transferred through the spine then down through the legs to the feet and then on to the floor. [E] There has thus been outlined, the more important features of Vertachair in order that the detailed description thereof may be better understood, and in order that the present contribution to the art may be better appreciated. There are, of course, additional features of Vertachair that will form the subject matter of the claim appended hereto. Those skilled in the art will appreciate that the conception, upon which this disclosure is based, may readily be utilized as a basis for the designing of other structures, methods and systems for carrying out the several purposes of the present trade mark design. It is important, therefore, that the claim be regarded as including such equivalent constructions insofar as they do not depart from the spirit and scope of the present trade mark design, titled “Vertachair” . [F] The purpose of the foregoing, is to enable the public, and practitioners in the art who are not familiar with new trade mark designs, to determine quickly from a cursory inspection the nature and essence of the technical disclosure of the apparatus . The foregoing is intended to define the trade mark design of the Vertachair, which is measured by the claims, it is not intended to be limiting as to the scope of the trade mark design in any way. [G] It is therefore an object of Vertachair to provide a new and improved chair design which has all the advantages of the prior art and new and improved advantages. [H] It is another object of Vertachair to provide a new and improved chair design which may be easily and efficiently manufactured and marketed. [I] It is a further object of Vertachair to provide a new and improved chair design which is of a durable and reliable construction. [J] An even further object of Vertachair is to provide a new and improved chair design which is susceptible of a low cost of manufacture with regard to both materials and labor, and which accordingly is then susceptible of low prices of sale to the consuming public, thereby making such chairs economically available to the buying public. [K] Another object of Vertachair is to provide a new and improved chair design wherein the same is formed as a chair that increases the effective manner of pain relieved,when sitting. [L] These together with the various features of novelty which characterize the trade mark design, are pointed out in claim that are forming a part of this document. For a better understanding of the trade mark design, reference should be made to the accompanying drawings, pictures and descriptive matter in which there is illustrated preferred embodiments of the design. A picture of “Vertachair:tm” is enclosed with this document and is a part of this document. Fig: 4 is a perspective view of the chair. [N] With reference now to the picture/drawings, and in particular to FIGS. 1,2,3 & 4 thereof, a new and improved chair design, titled “Vertachair” embodying the principles and concepts of the present trade mark design are enclosed. Vertachair is for effecting an increased ease of sitting and decrease pain of sitting and to enhance use. As to the manner of usage and operation of the trade mark design, the same should be apparent from the above disclosure and accordingly no further discussion relative to the manner of usage and operation of Vertachair shall be provided. [O] With respect to the above description then, it is to be realized that the optimum dimensional relationships for the parts of the trade mark design , to include variations in size, materials, shape, form, assembly and use, are deemed readily apparent and obvious to one skilled in the art, and all equivalent relationships to those illustrated in the drawings and described in the document are intended to be encompassed by the present trade mark design. The foregoing is considered as illustrative only of the principles of Vertachair. Since numerous modifications and changes will readily occur to those skilled in the art, it is not desired to limit the trade mark design to the exact construction and operation shown and described, and accordingly, all suitable modifications and equivalents may be resorted to, falling within the scope of the trade mark design. Enclosed within and as part of this document is a picture of a working prototype of the trade mark design titled “Vertachair”. VERTACHAIR : TM: Copyright-August 10, 2013: by Emmor Ray Sperry. The distinctive design of " Vertachair ", the word " Vertachair " and the three dimensional trademark of Vertachair are trademarks of Emmor Ray Sperry. The distinctive slope of the seat are part of the trade mark design of Vertachair. An exclusive copyright is claimed on the entire text, all drawings and sketches of “Vertachair” that exist and the design, titled “Vertachair”. Any infringement on this copyright or this trademark, in whole or in part, without permission in wrighting from Emmor Ray Sperry, is strictly prohibited. A United States registered copyright number is "TXu-1-878-303". *Shark Fins:tm allow a swimmer to perform all four swim strokes, Freestyle, Butterfly, Back stroke, Breast stroke and swim down under the water. Shark Fins-tm are an arm-fitting swimming apparatus. Shark Fins-tm comprise a swim fin blade attachable to the back of the forearms, wrists and hands of a swimmer and formed of a resilient material for improved propulsion while swimming. In a preferred embodiment, the fin comprises a single stiffening member, covering the back of the hand, the back of the wrist and the top of “the radius and ulna of the forearm”. The fin is attached to the forearm, wrists and hands, with a hand grip for the hand, and belt straps for the wrist and forearm. The embodiment of Shark Fins-tm in which an exclusive property or privilege is claimed are defined as follows. a one piece swimming fin blade that is attached to the hand, wrist and forearm of a swimmer. [3.2] An Arm-fitting swimming apparatus as set forth in claim 1 wherein one swimming fin blade is attached to each arm of a swimmer. [3.3] An Arm-fitting swimming apparatus as set forth in claims 1and 2 wherein the inside edge of the swim fin blade, toward the swimmers body and along the radius bone of the forearm , is a straight edge. The swim fin blade terminates, on the forearm, just before the elbow. The outside edge of the swim fin blade is irregular but in the general shape of a semicircle. [3.4] An Arm-fitting swimming apparatus as set forth in claims 1 and 2 and 3 wherein each swim fin blade is attached to the hand by a hand grip. The hand grip is on the under side of the swim fin and [it is near top area of the fin] is at ninety degrees to the straight edge and parallel with the swim fin body. The swimmers hand makes a fist around the swim fins hand grip. [3.5] An Arm-fitting swimming apparatus as set forth in claims 1 and 2 and 3 and 4 herein each swim fin blade is attached to the swimmers wrist by means of a fastening belt that is on the under side of the swim fins and fastened to the fins. The fastening belt straps are at ninety degrees to the straight edge of the swim fin and in the area where the swimmers wrist is placed on the fin, when griping the “hand grip”. [3.6] An Arm-fitting swimming apparatus as set forth in claim 1 and 2 and 3 and 4 and 5 wherein each swim fin blade is attached to the swimmers forearm by means of a fastening belt that is on the under side of the swim fins and fastened to the fins. The fastening belt straps are at ninety degrees to the straight edge of the swim fin and in the area where the swimmers forearm is placed on the fin, when griping the “hand grip”. The fastening belt straps on the forearm area of the fin are near the swimmers elbow. FIG. 2 shows a plan view of a preferred embodiment of a swim fin blade according to the trade mark design. A swim fin blade incorporating the principles of Shark Fins-tm comprises a relatively stiff swim fin which may be formed of a flexible plastic, such as a polyurethane, rubber or the like, although it is envisioned that to ensure assumption of the correct shape upon movement of the fin of the trade mark design through the water may require use of exotic high strength, low mass materials such as Kevlar or carbon fiber. The shape of the swim fin, in general configuration, is that of the printed capital letter “D”. The inside edge of the swim fin, toward the swimmers body and along the radius bone of the forearm , is a straight edge. The overall area of the swim fin blade is not relevant to the trade mark design. The hand grip is on the under side of the swim fin and [it is near top area of the fin] is at ninety degrees to the straight edge and parallel with the swim fin body. The swimmers hand makes a fist around the swim fins hand grip. The fastening belts for the swimmers wrists and forearms are on the under side of the swim fins and fastened to the fins. The straps are at ninety degrees to the straight edge and in the area where the swimmers wrists is placed on the fin and on the forearm area of the fin near the elbow. 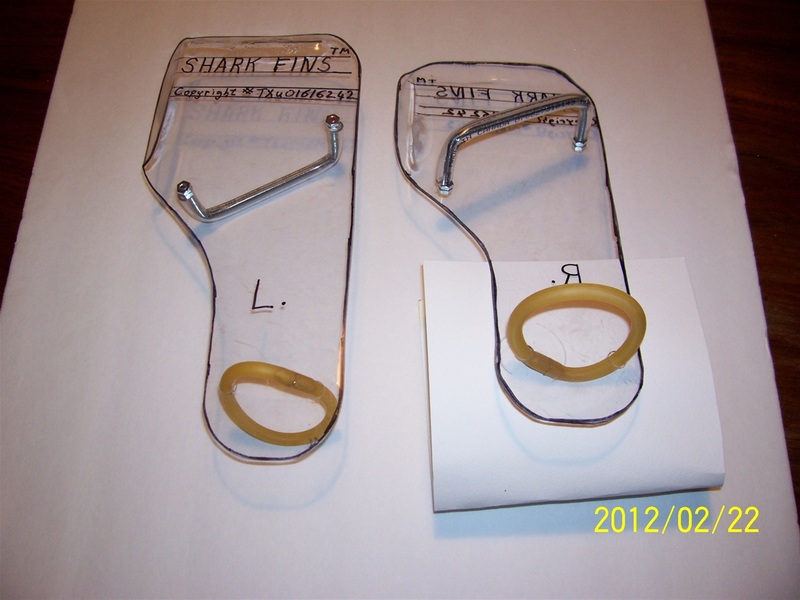 The Shark Fins relate to a swim fin, and more particularly relates to a new and improved Arm-fitting swimming apparatus fin utilizing a unique swim fin blade design, a unique hand grip on the swim fin blade and belt straps to fasten the wrist and forearm to the swim fin blade. The use of swim gloves with webbed fingers and hand plates or paddles for swimming use, is well known in the prior art. Swim gloves and plates are utilized to enhance the effective surface area of a swimmer to enhance the movement of a swimmer through water, while swimming. Swim gloves of the prior art utilize webbing of the fingers to enable manual dexterity and enhance the speed of the swimmer in water. The use of full length finger webbing and plates is to provide extra surface area when swimming and during water maneuvers, such as rescue operations, swimming in rough waters, or enhanced resistance to increase body strength for swimming. In prior art the hand is always open, when swimming, but a swimmer does not achieve maximum surface area of the hand, wrist and forearm. The prior art has not provided the availability of maximum effective surface area, of a swimmers hand, wrist and forearm, to enhance the movement of a swimmer through water, while swimming. swimmer through water. The present trade mark design substantially fulfills the needed, enhanced resistance of the hands, wrists and forearms when swimming. In view of the foregoing disadvantages inherent in the known types of swimming apparatus [ gloves and hand plates] now present in the prior art, the present trade mark design provides a swim apparatus wherein the same may be secured to an individual swimmers hand, wrist and forearm as desired, to effectively increase the effective surface area of the swimmers arms. The general purpose of Shark Fins, which will be described subsequently in greater detail, is to provide a new and improved arm-swimming apparatus which has all the advantages of the prior art swimming apparatus [ gloves, hand plates] and new and improved advantages. With this swimming apparatus the swimmers hand is closed, in a fist position, griping the “hand grip” on Shark Fins . There has thus been outlined, the more important features of Shark Fins-tm in order that the detailed description thereof that follows may be better understood, and in order that the present contribution to the art may be better appreciated. There are, of course, additional features of Shark Fins that will be described hereinafter and which will form the subject matter of the claims appended hereto. Those skilled in the art will appreciate that the conception, upon which this disclosure is based, may readily be utilized as a basis for the designing of other structures, methods and systems for carrying out the several purposes of the present trade mark design. It is important, therefore, that the claims be regarded as including such equivalent constructions insofar as they do not depart from the spirit and scope of the present trade mark design, titled “Shark Fins-tm” . The purpose of the foregoing, is to enable the public, and practitioners in the art who are not familiar with new trade mark designs, to determine quickly from a cursory inspection the nature and essence of the technical disclosure of the application. The foregoing is intended to define the trade mark design of the swimming apparatus, which is measured by the claims, it is not intended to be limiting as to the scope of the trade mark design in any way. It is therefore an object of Shark Fins to provide a new and improved arm-fitting swimming apparatus which has all the advantages of the prior art and new and improved advantages. It is another object of Shark Fins to provide a new and improved arm-fitting swimming apparatus which may be easily and efficiently manufactured and marketed. It is a further object of Shark Fins to provide a new and improved arm-fitting swimming apparatus which is of a durable and reliable construction. both materials and labor, and which accordingly is then susceptible of low prices of sale to the consuming pubic, thereby making such arm-fitting swimming apparatus economically available to the buying public. Another object of Shark Fins is to provide a new and improved arm-fitting swimming apparatus wherein the same is formed as a swim fin that enlarges the effective surface area of the swimmers arms. These together with the various features of novelty which characterize the trade mark design, are pointed out in claims annexed to and forming a part of this document. For a better understanding of the trade mark design, reference should be made to the accompanying drawings and descriptive matter in which there is illustrated preferred embodiments of the design. [18A] FIG. 1 is an isometric illustration of the arm-fitting swimming apparatus fin blade [Shark Fins-tm] with the swimmers hand, wrist and forearm facing up and gripping the “hand grip” and the wrist and forearm fastened, with the belt straps, to the fin blade. [18B] FIG. 2 is a top view illustration of the arm-fitting swimming apparatus of the trade mark design. With reference now to the drawings, and in particular to FIGS. 1 and 2 thereof, a new and improved Arm-fitting swimming apparatus, titled “Shark Fins-tm” embodying the principles and concepts of the present trade mark design. More specifically, it will be noted that the arm-fitting swimming apparatus of the trade mark design titled “Shark Fins-tm” substantially comprises an arm-fitting swimming apparatus includes a distinctive fin blade design FIGS. 1 and 2. [A], the distinctive and unique hand grip FIGS. 1 and 2. [B], and the wrist and forearm belt straps FIGS. 1 and 2. [C] . Shark Fins [arm-fitting swimming apparatus] is for effecting an increased surface area to enhance use by swimmers; for use in rough water, rescue operations, and to be utilized by strong swimmers. It is further understood that the Arm-fitting swimming apparatus is made in matching pairs, whereas only the left is illustrated but the right hand understandably is simply a mirror image of the left hand and its illustration is not deemed necessary. As to the manner of usage and operation of the trade mark design, the same should be apparent from the above disclosure and accordingly no further discussion relative to the manner of usage and operation of Shark Fins –tm shall be provided. The foregoing is considered as illustrative only of the principles of Shark Fins-tm. Since numerous modifications and changes will readily occur to those skilled in the art, it is not desired to limit the trade mark design to the exact construction and operation shown and described, and accordingly, all suitable modifications and equivalents may be resorted to, falling within the scope of the trade mark design. SHARK FINS-TM: Copyright-December 10 , 2007: by Emmor Ray Sperry. The distinctive design of " SHARK FINS ", the words " SHARK FINS " are trademarks of Emmor Ray Sperry. The distinctive fin blade design, the distinctive and unique hand grip, and the wrist and forearm belt straps are all part of the trade mark design of Shark Fins. An excusive copyright is claimed on the entire text, all drawings and sketches of “Shark Fins-tm” that exist and the arm-fitting swimming apparatus, titled “SHARK FINS”. Any infringement on this copyright or this trademark, in whole or in part, without permission in wrighting from Emmor Ray Sperry, is strictly prohibited. A United States registered copyright number [TXu001616242]. American, Canadian and foreign patents are under acute rumination & consideration. In 2018 and the years of global positioning and Goggle Earth a new world map is only about 200 years late. [ha-ha] This world map projection would have been a real hit in 1850. 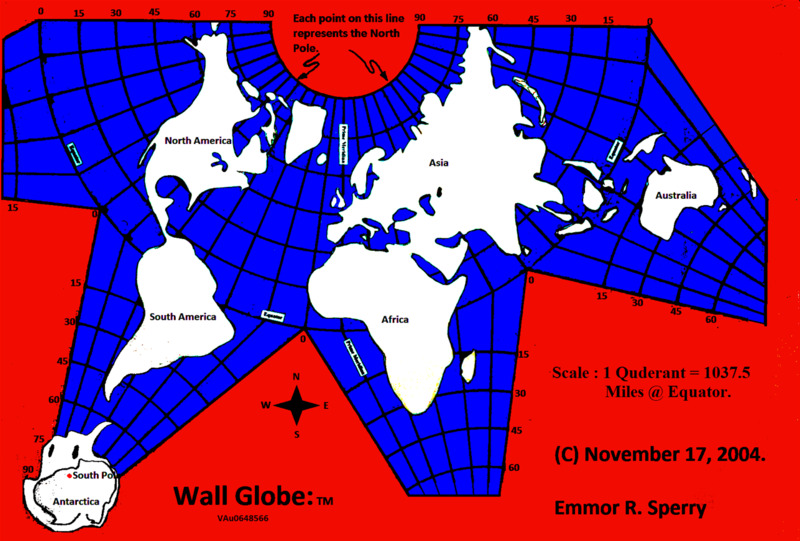 Wall Globe:TM is a new world map projection. What makes this projection different and maybe a little better than former world projections like Mercator, Molleide, Boggs and Robinson is that the land is not cut up and the land pieces [Continents] are at a relative correct size to each other. Greenland is much smaller than Australia in the real world and it is on this map as well.